The Alaska Industrial Development and Export Authority (AIDEA), a state agency, has proposed building a road to the Ambler Mining District to promote hard rock mining in that region. The road would serve a private Canadian company while imperiling food sources, clean water, wildlife, and habitat across a broad and wild region of Arctic Alaska. The road would cross Gates of the Arctic National Preserve and the Kobuk Wild and Scenic River, ecologically significant public lands. The road would bisect a wide swath of the Southern Brooks Range, which is home to grizzly bears, wolves, Dall sheep, moose, wolverines, and three different caribou herds, including the Western Arctic Caribou Herd. The road would also cross 2,900 streams, 11 major rivers, and 1,700 acres of wetlands, all vital to the health of whitefish, sheefish, salmon, pike, burbot, grayling, and other species that are important subsistence resources. The permit application for the project fails to fully describe details of the project, or provide adequate information about the potential impacts to or the protections for the waterways, fish, wildlife and people of the region. AIDEA would supposedly prohibit public access on the road, while at the same time hoisting the financial, environmental and cultural risks on the backs of Alaskans. Alaskans can make their voices heard by sending comments to the Bureau of Land Management by January 31st through mail, fax, or email (blm_ak_akso_amblerroad_comments@blm.gov). Read our tips about how to make comments during the scoping period, find out more about how to protect Gates of the Arctic, and read below for additional details on concerns about the proposal. The proposed road would connect the Ambler Mining District in the Kobuk River Valley in the northwest Arctic, southwest of Gates of the Arctic, to the Dalton Highway, commonly referred to as the haul road. Many of the rock formations in the mining area are part of a sulfide deposit, and are highly likely to form acid mine drainage. Acid mine drainage forms when the sulfide rock is exposed to air and water. A weak acid develops, which mobilizes the heavy metals and toxic contaminants into solution, flowing to lakes and streams. This drainage can cause serious contamination problems that last hundreds, if not thousands, of years and can harm or kill fish and other wildlife. BLM needs to consider the negative impacts of development in the Ambler Mining District in this scoping process. Many of the mining claims in the Ambler District also drain into the Kobuk River, which is home to key subsistence species, such as the sheefish. Rivers, streams and entire watersheds that are the cultural and subsistence lifeblood of communities in the region will be put at risk. The proposed road would further disrupt the migratory route of the Western Arctic Caribou Herd, an important cultural and subsistence resource for over 40 Alaska Native villages in the Western Arctic. The road would intersect with the migratory routes of three caribou herds, and could have significant negative impacts on the health of these animals. 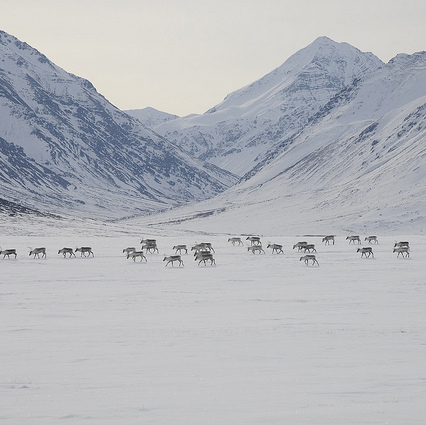 The health of many Alaskans depends on the health of these herds. AIDEA claims the total cost of building, operating and maintaining the proposed road will reach $844 to $906 million, though the actual cost may be much higher. Over a dozen communities, tribes, and other entities directly impacted by the project have passed resolutions or loudly spoken out in opposition to the project. It is important to note that the proposed road would run near, but not directly through, any communities. In other words, villages would suffer all the negative impacts of the industrial road—including the potential loss of subsistence resources—without gaining any of the benefits of being connected by the road, such as cheaper fuel or employment opportunities. AIDEA’s permit application provides only a bare-bones project description that in many instances raises more questions than it answers. It has not explained how it would keep the road private and run it as a toll road. It has not shown how it would protect the area’s waterways, wildlife, and communities. BLM needs to consider the lack of information in the permit application, as well as the potential impacts of the proposed road on nearby communities, wildlife, vegetation, permafrost—and future impacts if and when the proposed road becomes public. BLM should use this scoping process as an opportunity to truly listen to concerns from individuals, tribes, and local and community groups, and to protect the fish, wildlife, and special places of the Southern Brooks Range from this essentially private industrial development project paid for by the public.